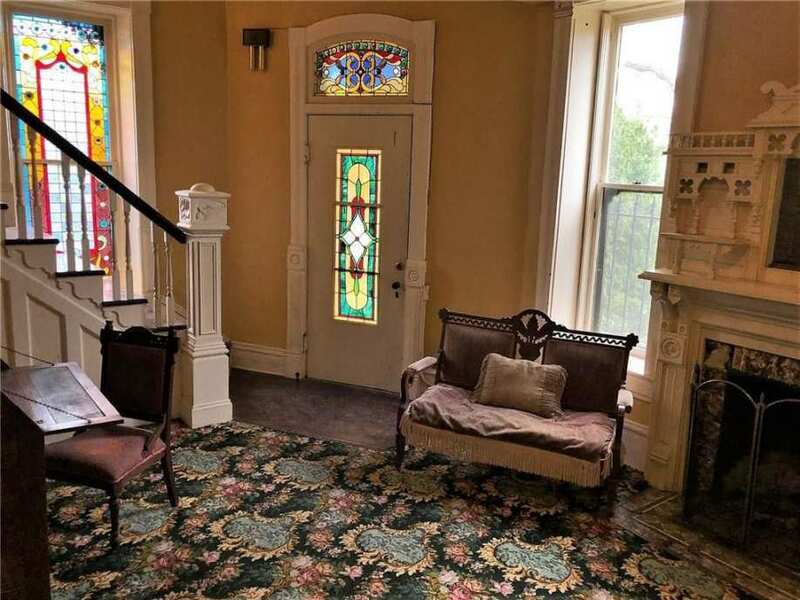 Eureka's most historic Victorian home, Penn Castle, has as colorful a past as the town itself. 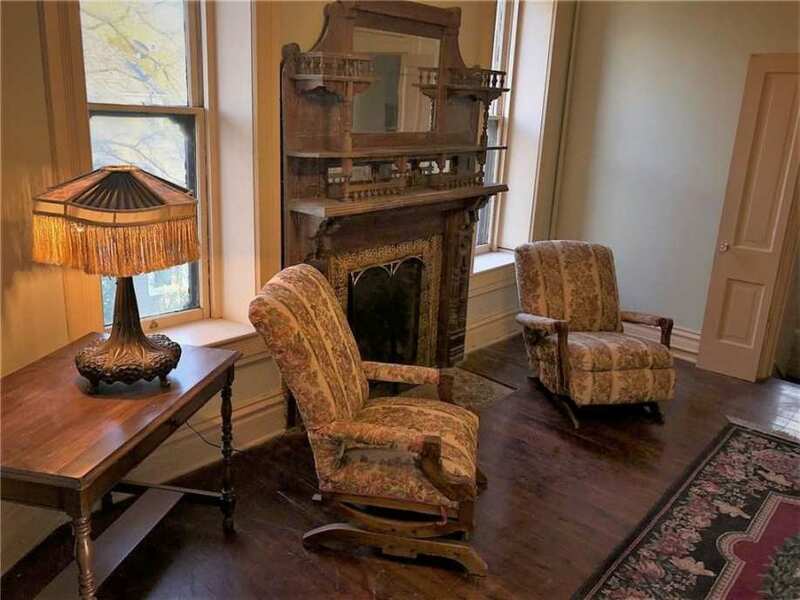 Built in 1888 for evangelist Major William Evander Penn, Penn Castle was inspired by Penn's travels to Europe. 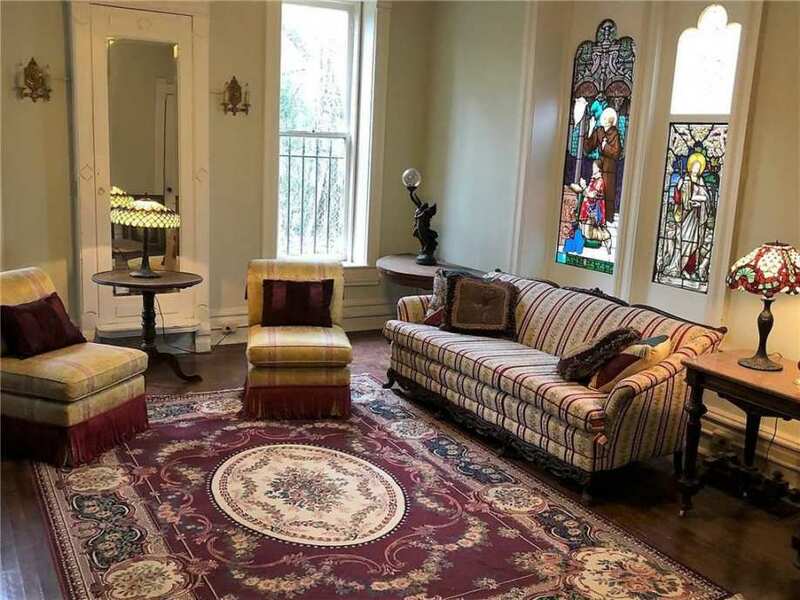 The home and its religious themed stained glass windows in the parlor were featured on the HGTV program If Walls Could Talk. 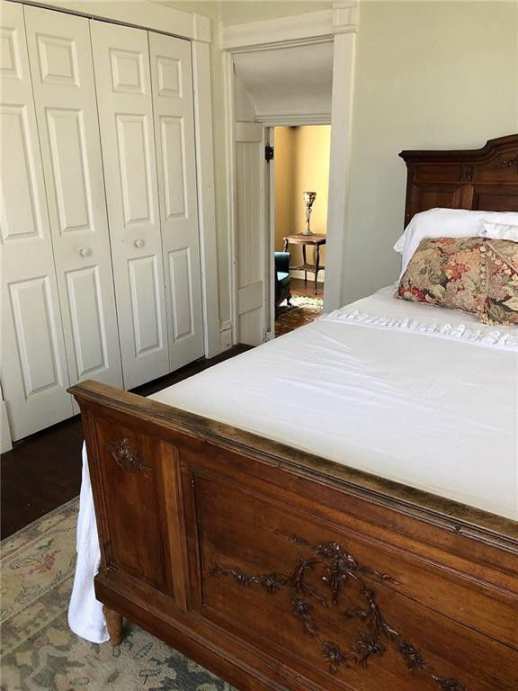 The home is built of limestone and boasts some of the most well preserved millwork of the time including ornate fireplace mantels and other unique architectural details. On the site many years ago, don’t believe it sold between that time. 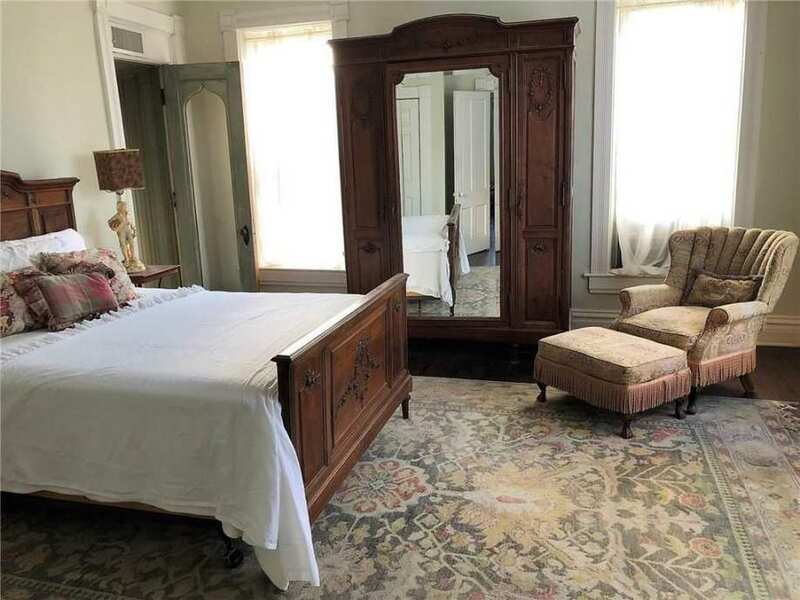 Many years they had terrible interior photos, glad to see we get a clear view inside now. I’ve seen this house a few times, from the outside only. I had no idea what great things the inside was holding. 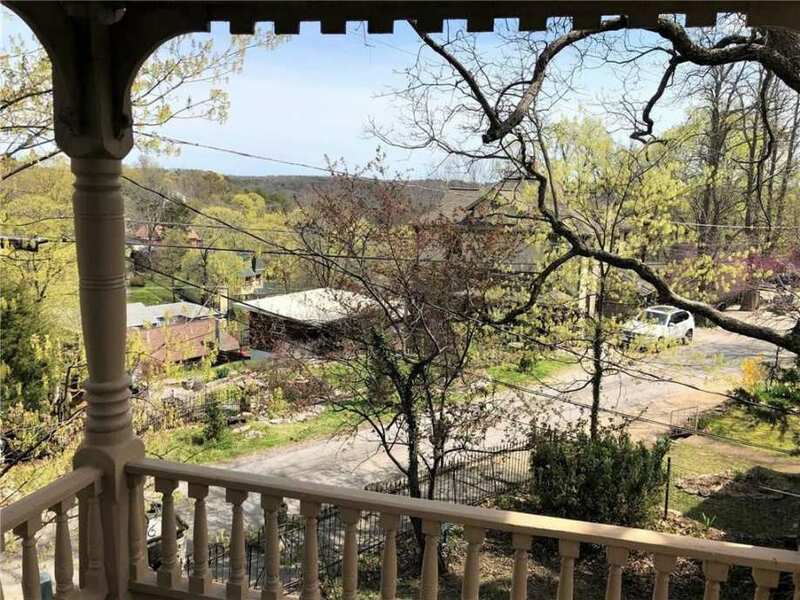 Eureka Springs is an awesome little mountain town. 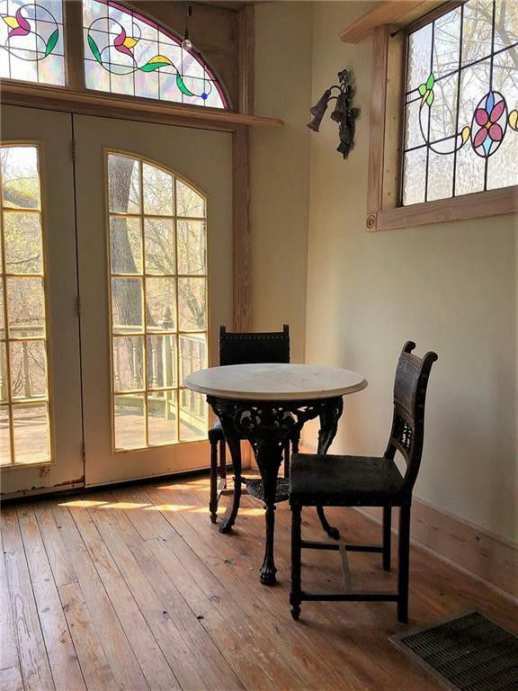 Eureka Springs is a treasure trove of old homes. 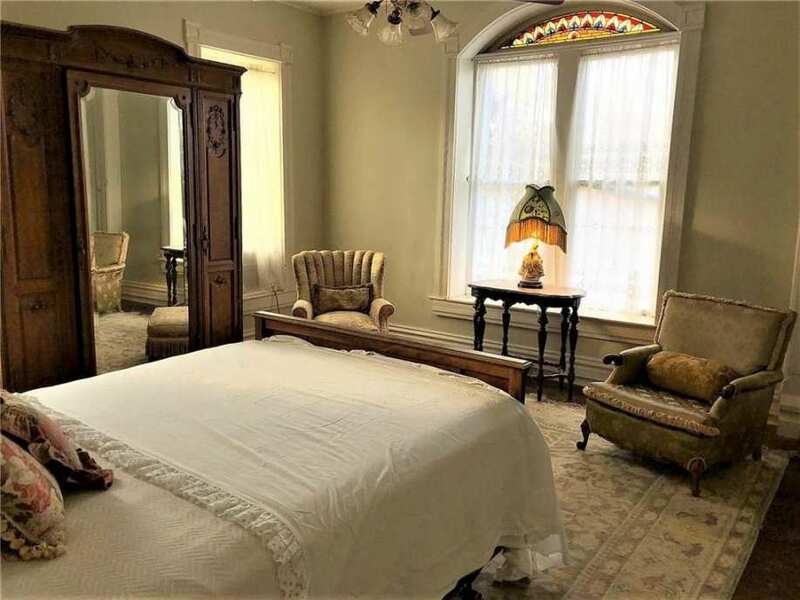 Many have been turned into B & B or wedding venues. The Crescent Hotel is also worth a visit if your in the area. What a beautiful home! 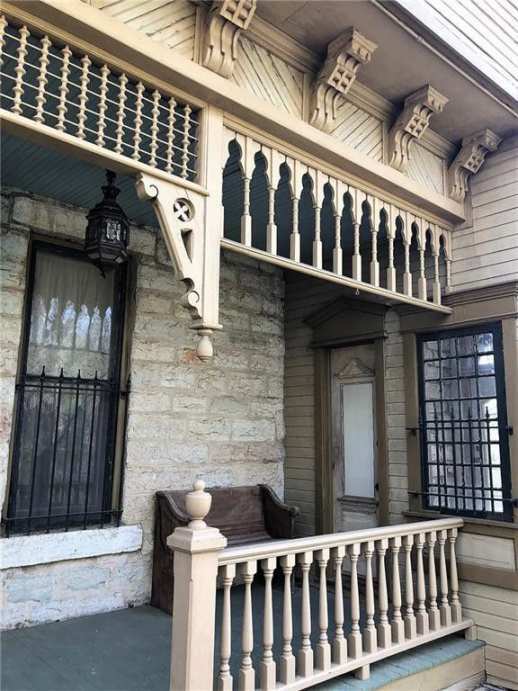 Great architectural features! And it’s tastefully decorated too! All so pretty. I’ve been slowly falling in love with Second Empire more and more. 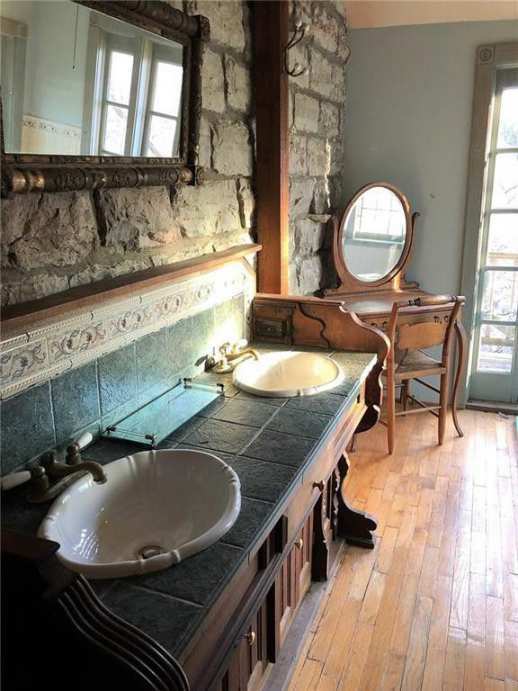 The interior stone wall photos are my favorite, particularly the double-sink vanity with antique mirror. Reminiscent of a far distant time and place. Well done! I lived in ES for a decade 20 years ago. 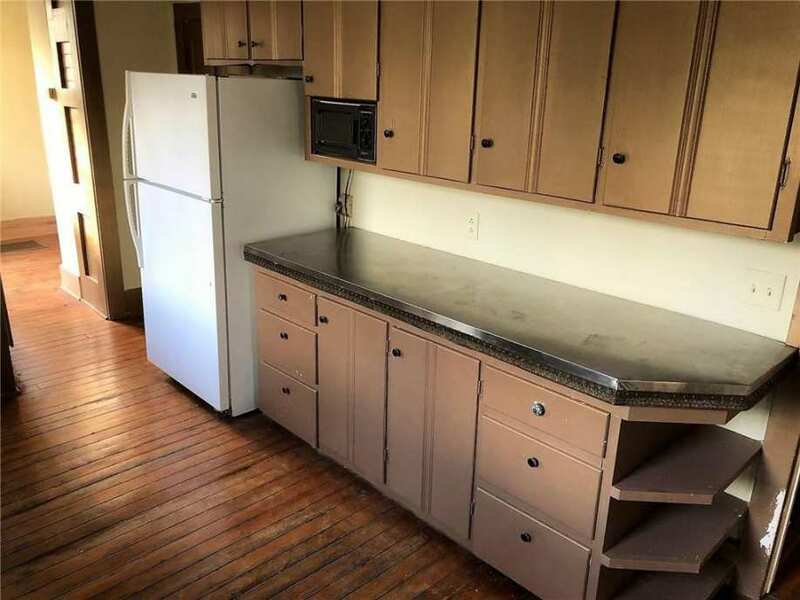 The current owners have done a great job renovating this place. Unfortunately at some time the little chapel was allowed to collapse. 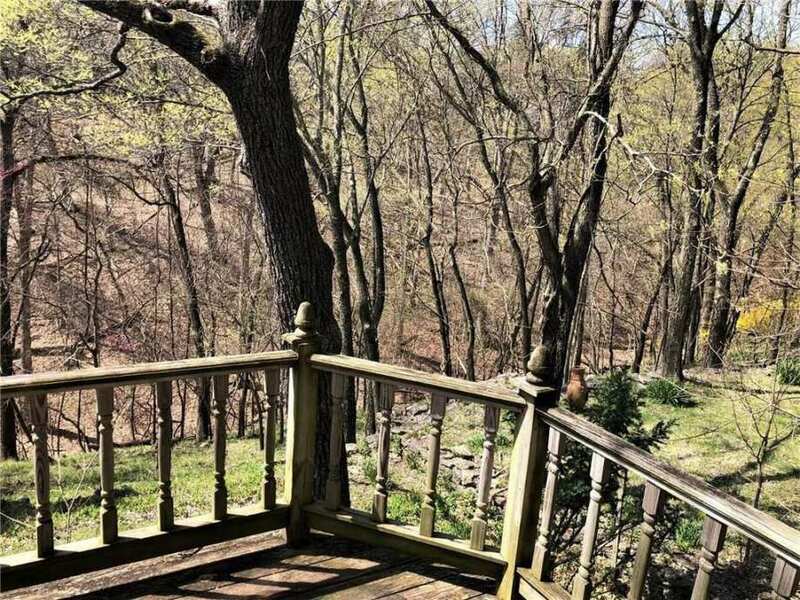 Still a great property with magnificent views. I do remember seeing this some time ago with terrible pictures. These are much better. The stained glass windows are beautiful. I wish I could see floor plans….I am totally lost as to the flow of the house, but anyway it is unique and beautiful. Arkansas has some truly beautiful country. Painted woodwork is ok sometimes. 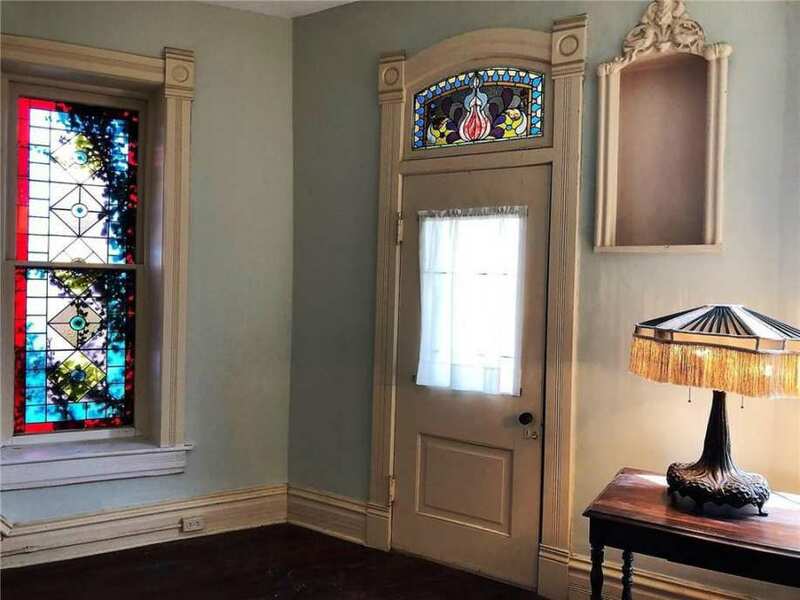 Yet with the intricacy of the carving and detail in the first formal room pictured I think it detracts not to have the coloring of the wood against the stained glass windows. i kept waiting to see the staircase? 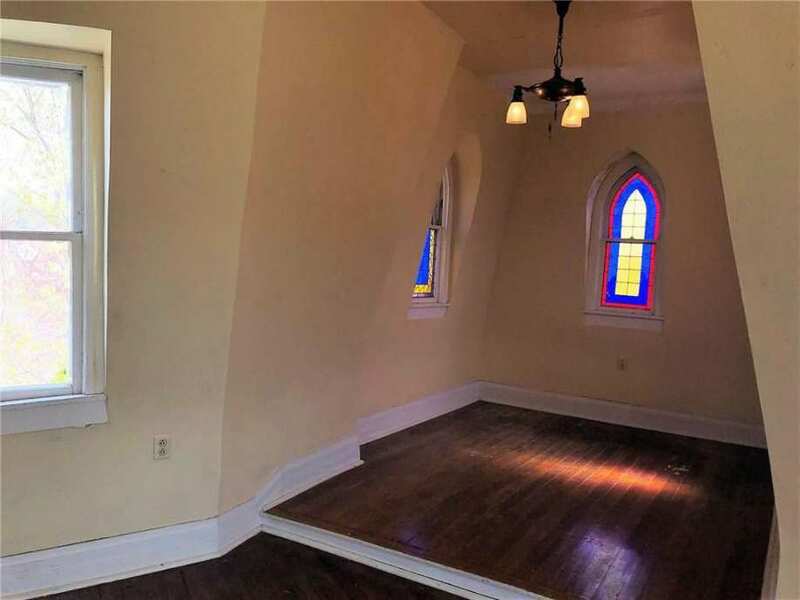 with some of the great woodwork, i would expect it to be a jewel. 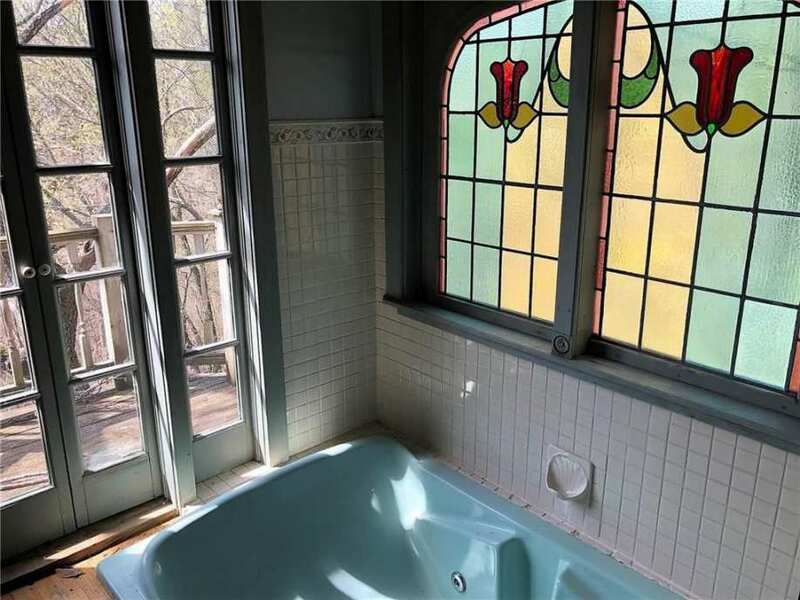 and those side by side stain glass windows appear to be painted glass. and the theme is religious. i rather doubt they are original? 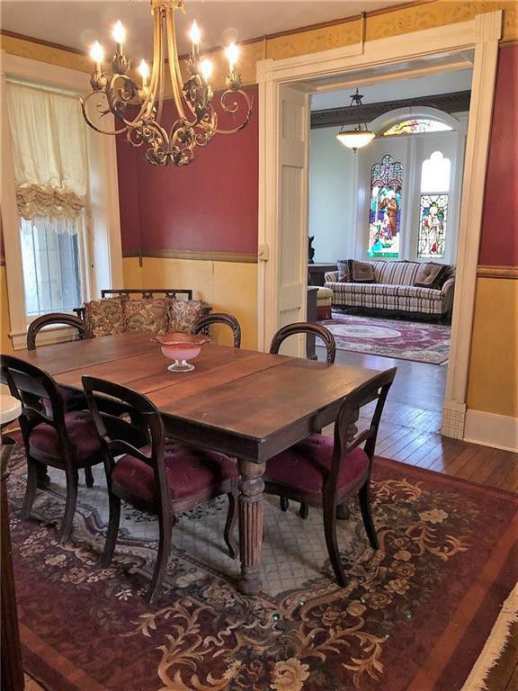 Doug, in picture 16 of the foyer, I believe there is a newel post in the far left of the picture it is painted white. Unless this is something else entirely. I too would love to see the staircase. 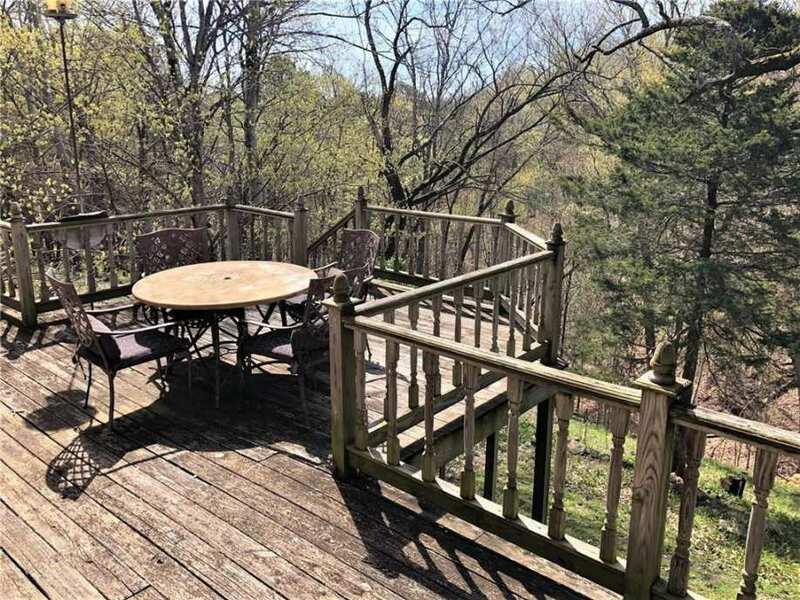 Gorgeous home but the gardener in me says their yard/property needs to be tidied up and new trees and plants put in. It would really help the curb appeal. Though I agree with some what both Julie and Barbara say here, I agree with Julie C that the front yard to me would be better trimmed up. I’d also clear it out. Leave some of the old trees of course but all the shrubs and bushes covering the house I’d remove. The exterior of this house is perfect! WOW. Most of the original detail still there. The interior has had some modifications that don’t suit my taste personally. 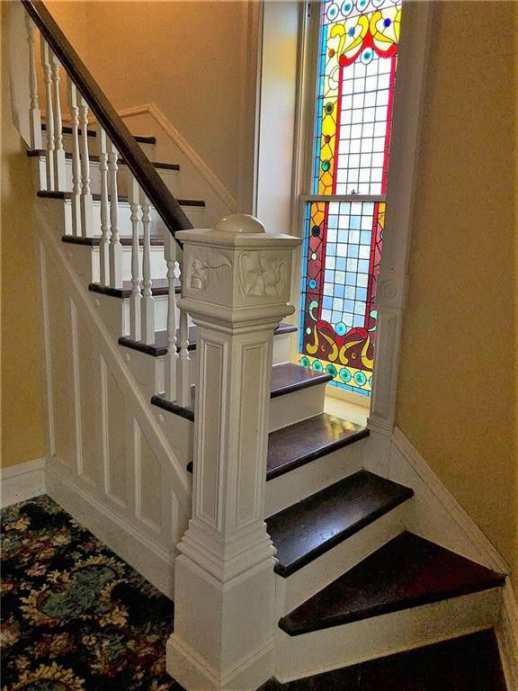 But some of that art glass windows are wonderful especially on the staircase. 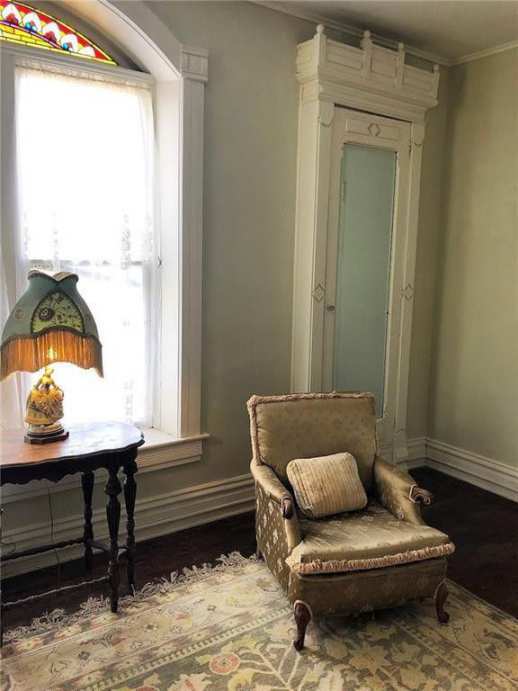 IMO, the front door has to be replaced with a period door. 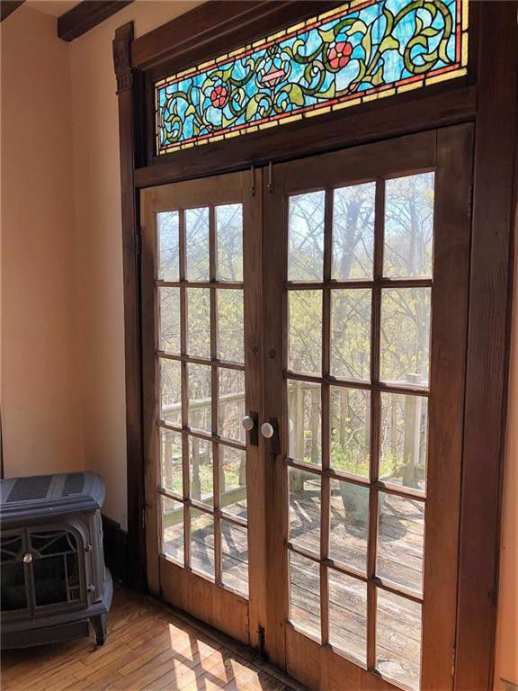 I personally would pull out the french doors as I don’t like those doors in houses like this, and I would paint the back deck to match the house trim and design. I don’t like modern house concepts on these homes personally. 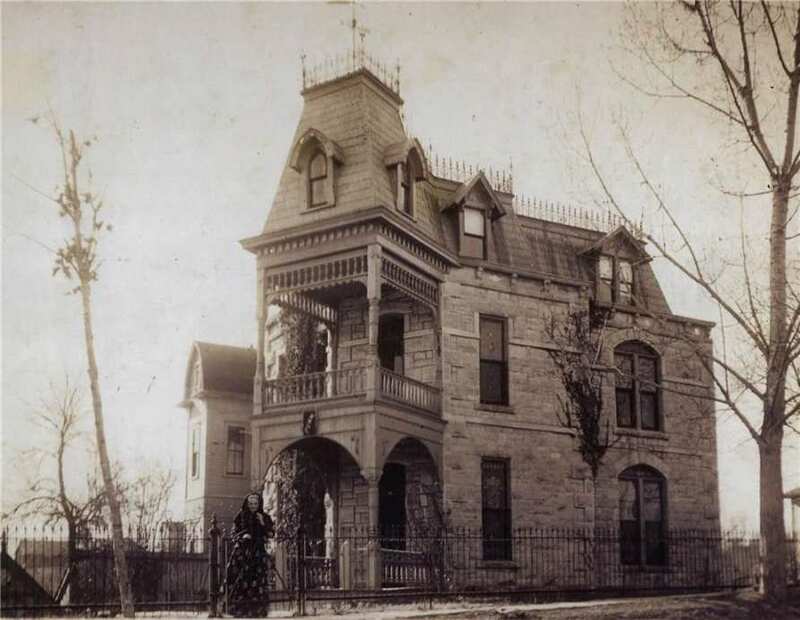 I always love when there is an old photo of a house. That’s a real prize! Thanks! The shrubs/trees that are right up against the house should definitely be removed. Aside from aesthetic issues, the roots could undermine the structure of the house and of course it is blocking out sunlight. The larger trees should also have their lower limbs cut off. 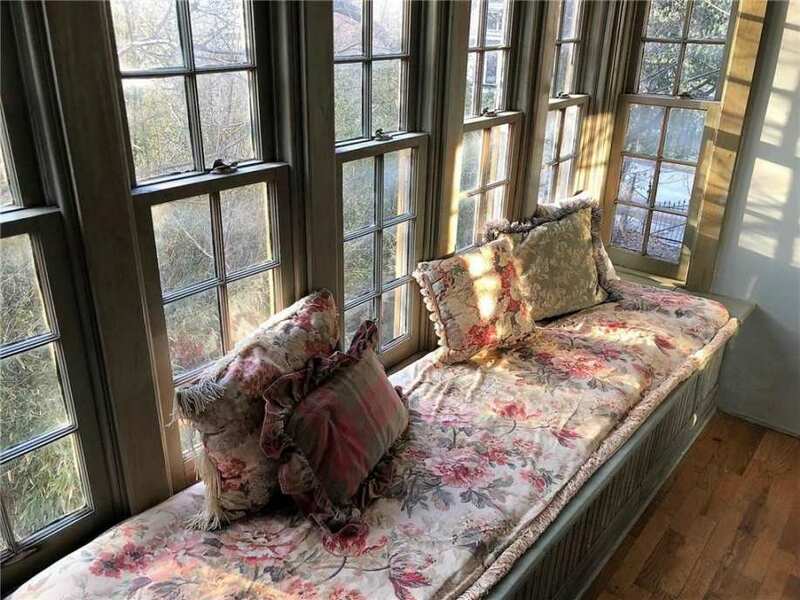 Not only would this make the trees tidier but it would enhance the appeal of the house because it is more visible and of course allow more access to sunlight. I love trees and have ten acres. 7 of them are covenanted native bush (meaning it can never be built on nor are any livestock allowed on it) and three former paddocks that we have planted trees on over the years – you have to give a lot of thought to where the trees are placed. And I have 30 Liquid Ambar/Sweet Gums planted along my driveway. I don’t have any trees next to my house because the soil gets too wet, there really isn’t the room and it would block the sun (when it is out – it rains a lot). I do love grand trees or some nice mature beautiful greenery around. I agree with Barbara about the stripped out and bland look of the McMansion. That’s become a terrible trend. But like you said and I’ve also experienced, all sorts of damages can happen with excessive growth on or hanging over the house. Especially tree branches. There is a right way to balance mature growth, and not let it take over or even obscure the house. 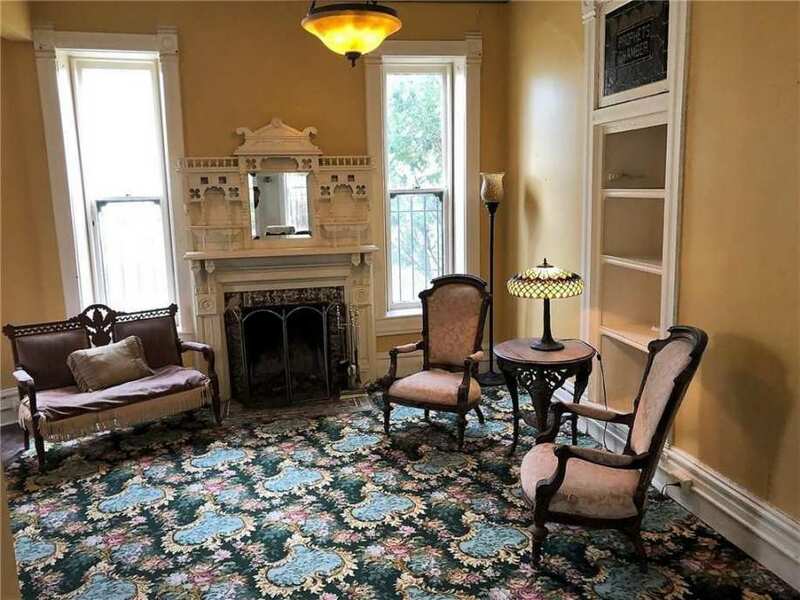 A trend that modern people have stopped but our Victorians loved, was the practice of growing vines all over the house. Some photos show houses with vines covering everything. So bad for the house. I love the vines too but they are destructive. We had to rip out a big Wisteria from an old cottage we once owned because it was eating the house. Don’t get me started on McMansions – hideously designed homes on tiny lots…. 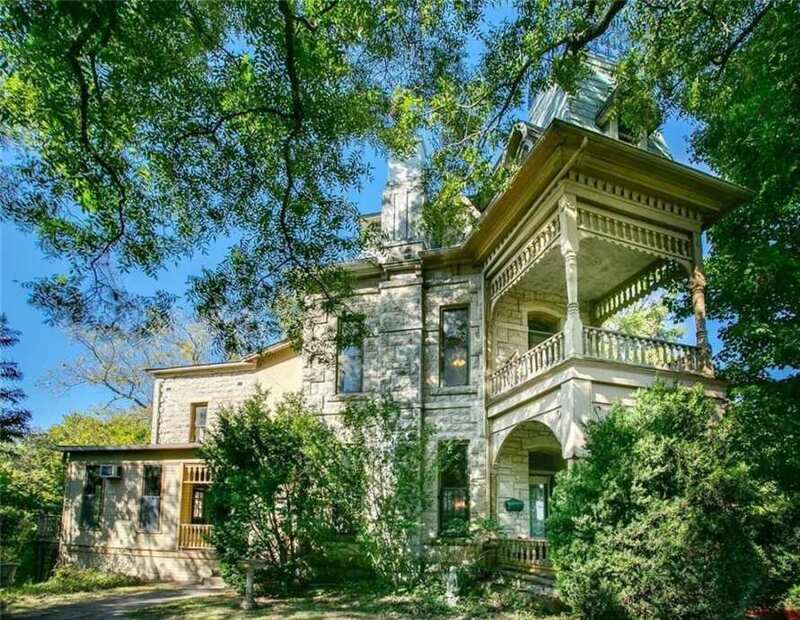 The exterior of this house is so unique and intriguing. 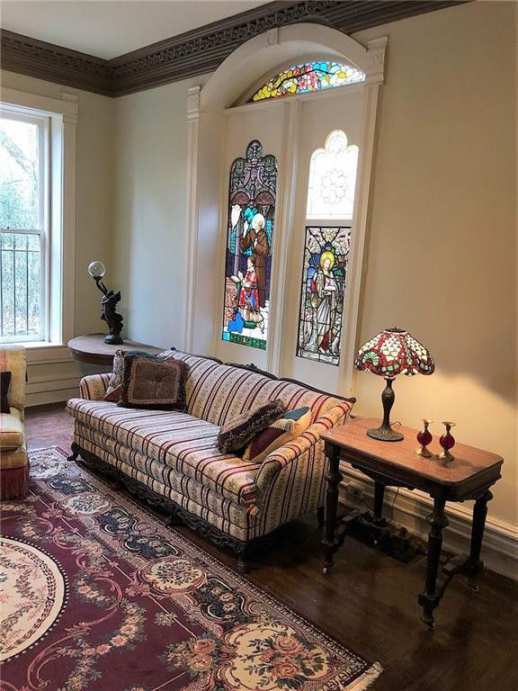 Beautiful stained glass, woodwork an fireplaces. 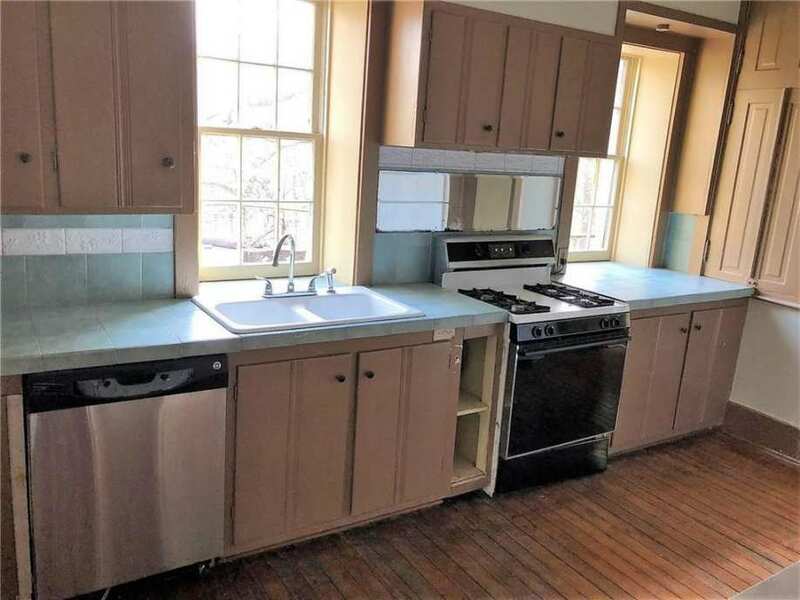 I wish they would have shown more pictures of the bathroom with the double sink vanity, that cabinet is gorgeous. Ah all beautiful! Never seen such original sink, such integrity! 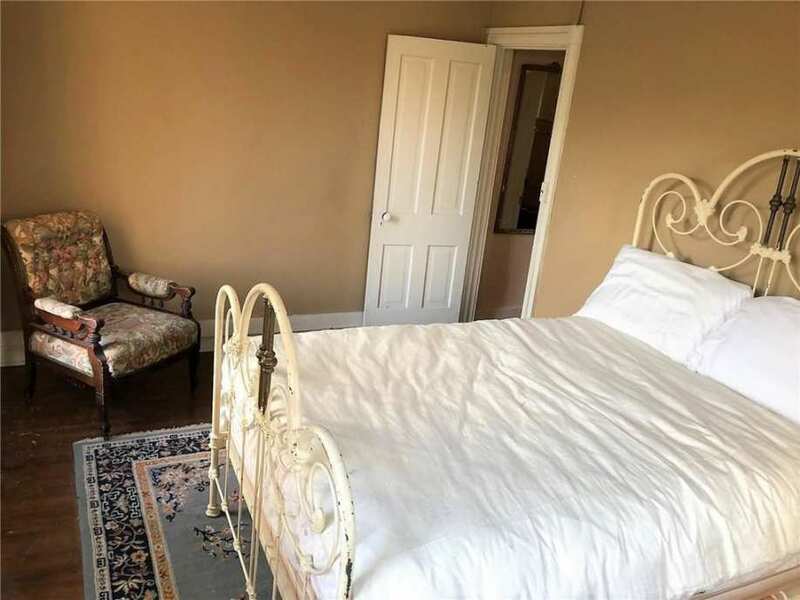 New agent and listing photos. 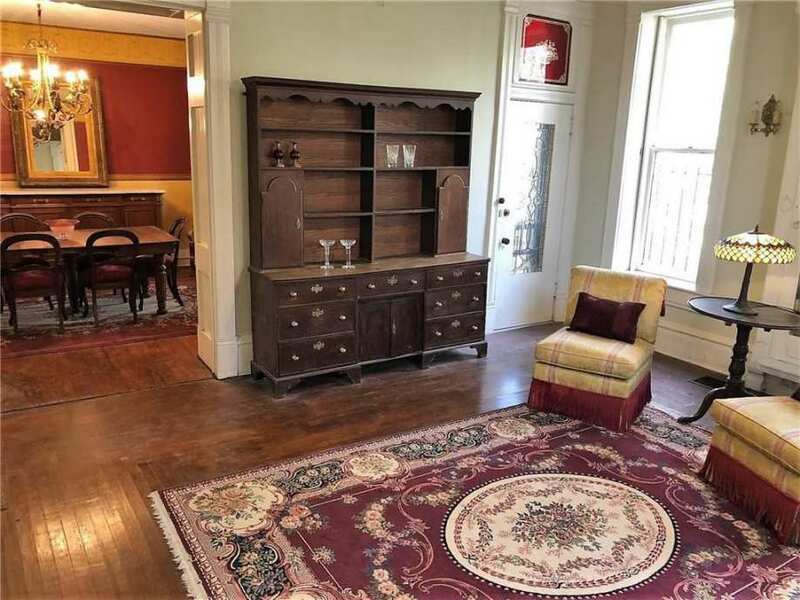 This agent also included a cool old photo of the home. OMG, OMG, OMG! So much to see and love! 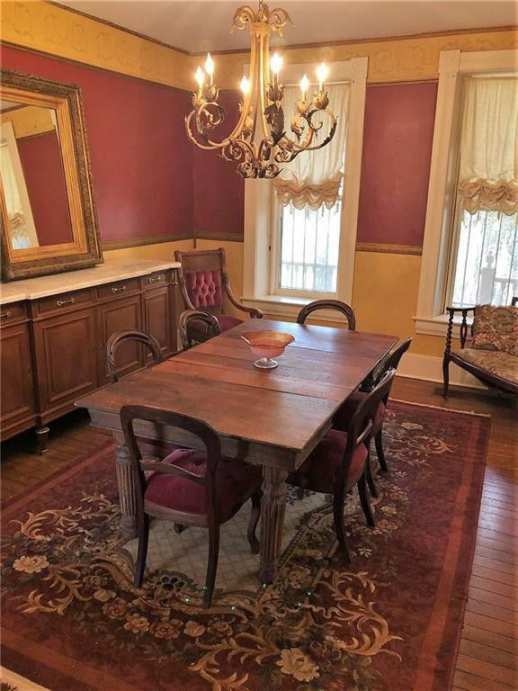 Glass, glass, glass, built-ins and fireplaces, oh, my! In the vintage view there is a three story tower like section at the back, behind the lady at the gate. I was told by the owners of 20+ years ago that those were privies/bathrooms. Don’t know if it’s true or not, but it would be cool to restore the tower. My kind of home, in my dreams. This is a lovely place! I was raised in OK and TX and many folks in that neck of the woods go to ES on vacation. I always loved it there just because of the old houses. You know what I particularly like about this? 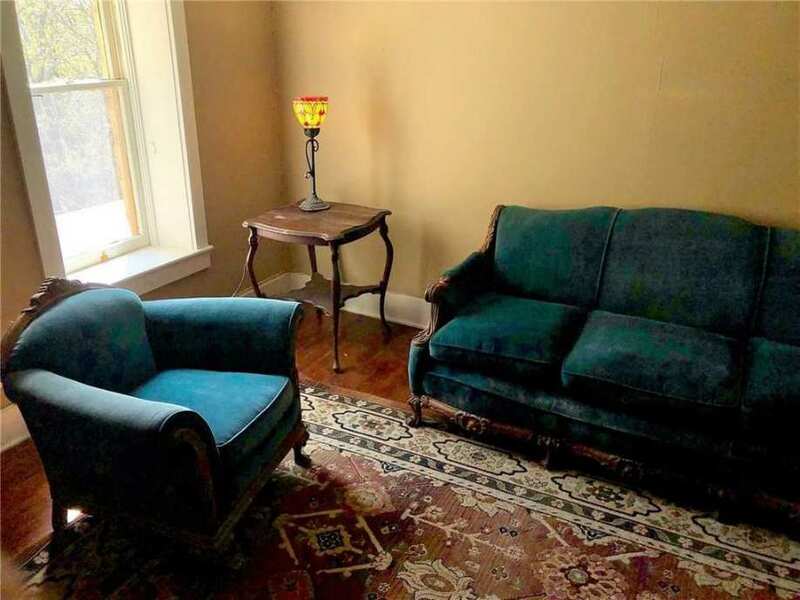 The furniture blends pretty seamlessly in nearly every room. None of the puffed up sofas and recliners or worse the ‘theater seating’ with cup holders. And of course the stained glass is spectacular! It’s just simply comfy, homey and beautiful. What a masterpiece ! I did a walk-about. If you can find your way downtown, it’s the coolest! I would love to visit this town.